After training in England in 1944, the 9th Infantry Division was to prepare for something big. This was D-Day, the Normandy Invasion! Men of the 9th Infantry Division seek cover at the seawall on Utah beach in 1944. The wall is still there today. The Cotentin Peninsula was cut, but the enemy made a desperate attempt to break out near St. Jacques de Nehou. Artillery and a terrific mortar concentration massacred this force. The 9th then turned north toward Cherbourg. The 39th Regiment went through Octeville while the 47th Regiment seized the western half of the town and the arsenal. Meanwhile the 60th Regiment was protecting the left flank and preparing for an attack up the cape. During this campaign the 9th Division captured Lieutenant General Karl Wilhelm von Schlieben and Rear Admiral Hennecke, senior enemy Army and Navy commanders of the Cherbourg area. They were immediately brought to the Division CP where ensued a bit of repartee which shortly became famous. Robert Capa, Life magazine photographer, appeared at the Division commander’s tent to take pictures of the captured officers. But the Germans definitely had other notions. Von Schlieben was particularly difficult. “I am tired of this picture taking,” he snapped. 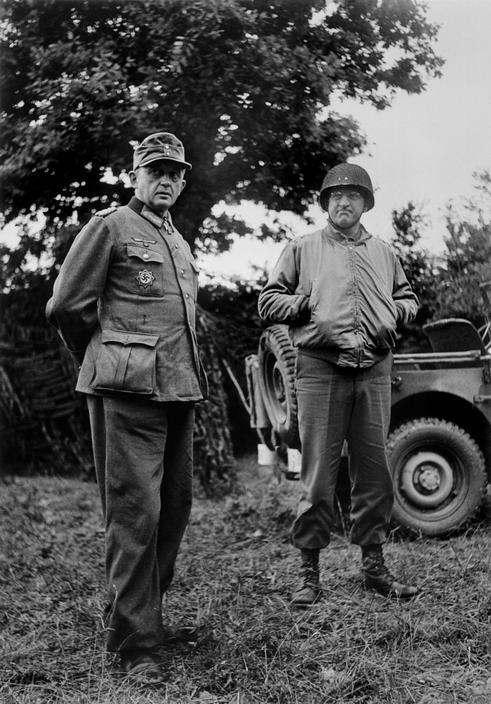 One of Robert Capa’s Pictures of the German General Karl Von Schlieben (left) and 9th Infantry Division General Manton S. Eddy (right) near Cherbourg in 1944. While other forces occupied Cherbourg, the 9th Division cleaned up the Cap de la Hague by July 1st, 1944. The 9th Infantry Division had accomplished the opening chapter of the invasion drama.